"Perfume lovers who own a substantial number of bottles tend to reach a point in their collecting habit where considering a purchase becomes about deciding if this new (or old) perfume is worth the shelf space and its place in their rotation, since acquiring and wearing a new scent means less skin time for the other loves. In other words, we become so particular that a perfume needs to wow us if it is to join the other treasures in our cabinets." For art collectors, instead of shelf space it's wall space. Instead of less skin time for certain perfumes it's less view time for favorite paintings. Greg and I manage our over flowing art collection by rotating the artwork every six months or so. If either one of us has a show and our artwork is sent away to a museum or gallery then that will conveniently cause instant rotation. As a creator of botanical perfume my main challenge is staying being too repetitive with certain notes. I have favorite materials for different needs. Usually I am in love with all the Jasmines but do not necessarily reach for Jasmine each time I create a perfume. Labdanum on the other hand is a note that I have adored since the first day it danced across the ol'factory. Besides the delicious, amber notes I am rather found of the fixative properties of labdanum, especially when combined with other essences. The benefit of botanical perfume is that since the chemicals are not clingy and super long lasting then the real estate space can be less of an issue. If a perfume only lasts say six hours, than that frees up the space to apply yet another favorite fragrance. Within a twenty four hour day, depending on the strength of fixation, that opens the door for quite a bit of scentual enjoyment within one day and night. 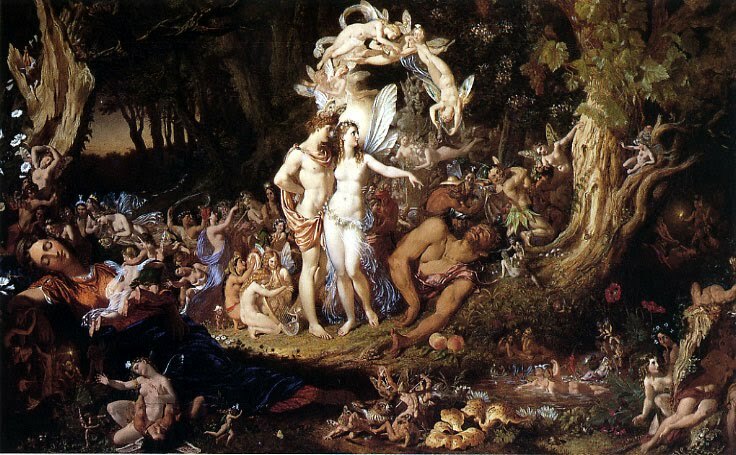 Image: The Reconciliation of Titania and Oberon. Oil on canvas, size 30 x 48.5 inches, National Gallery of Scotland, Edinburgh.